Sometimes, comparisons are unavoidable and it’s a fate which will doubtless undermine what Lidwine has achieved. Close your eyes when listening to her first EP and you can imagine listening to some lost Björk tracks from the 1990’s. This is not just because this French lady is a quirky singer-songwriter but she also sounds just like her. A shame, because the quality of this EP is superb. ‘Until The Light Comes’ overdoes the elongated vowels but the song is an atmospheric slow-builder and a useful scene setter for what is to follow. Arguably the most stunning moment is reserved for ‘A Resonance Of Myself’, which features Lidwine’s quivering emotional vocals balanced perfectly atop some gently bubbling electronica. On ‘In The Half Light’, lyrics such as “If I freak you out with my weird sense of humour” sees the artist acknowledge her idiosyncracies; the chorus is wonderfully warm and the final two songs continue the trend with surprise melodic twists and emotion aplenty. 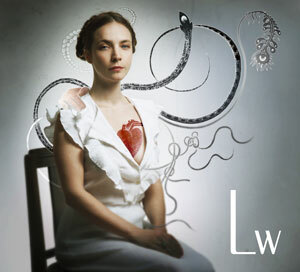 In fact each track is excellent and exquisitely arranged, marking out Lidwine as a talent to watch for 2011 and beyond. Whisper it quietly but even if this record may be reminiscent of Björk, it has an intimacy and likeability which the Icelandic artist lost over a decade ago.